$10k prize pack to be won! The Interislander ferry is the longest running Cook Strait ferry service in New Zealand. Interislander sails between Wellington (North Island) and Picton (South Island). Our Interislander ferry is known as one of the most beautiful ferry journeys in the world and one of New Zealand's most iconic tourism experiences. The Interislander is one of the unmissable Great Journeys of New Zealand. It connects to our scenic rail experiences; the Coastal Pacific, which runs from Picton to Christchurch, and the Northern Explorer which journeys through the heart of the North Island. The timetable below is a reference guide only. For accurate sailing times, please search our fares or see the Arrivals & Departures board. The journey across the Cook Strait takes 3 to 3.5 hours and we have several sailings daily from Wellington to Picton. The journey across the Cook Strait takes 3 to 3.5 hours and we have several sailings daily from Picton to Wellington. Get today's sailing schedule with accurate departure and arrival times, including disruptions and cancellations. Get the latest Interislander deals! Find all the latest Interislander special deals and discounts in one place! Whether you're travelling with us by car or coming by foot, find out how to get to our terminals. Been there, done that, got the t-shirt? If not, visit our store and get souvenirs shipped directly to your home!. Read our Check-in and Boarding procedures before you arrive to help everything go smoothly on the day. 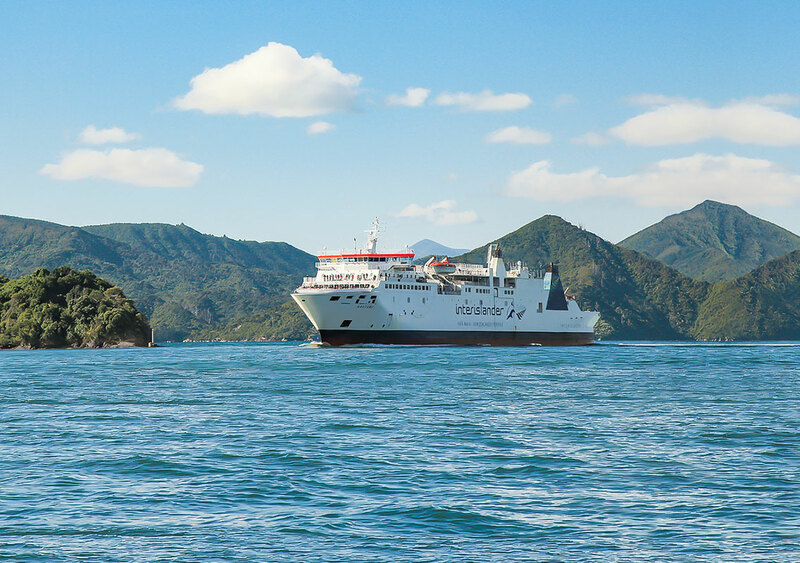 Kaitaki can carry 1,350 passengers and is the largest ferry operating in New Zealand waters. On board she features a huge Ocean View restaurant, Hector's Café, Local Heroes Sports Bar with Sky Sports, a large soft play area for young children, a shop, cabins, nurseries, and a number of lounges. Kaitaki's most prominent features is her Lookout Lounge Atrium area, which brings the scenery floating in through two floors of enormous windows! Aratere is our longest serving vessel. With eight separate viewing areas, including a large roof top seating area and a viewing deck on the bow, Aratere was built to show off the picturesque Marlborough Sounds. Inside, she features a large Food Court, a Hector's Coffee Bar and Shop, a children's play area with slide, nurseries and Quiet Lounge. Kaiarahi is the newest member of our ferry fleet. On board, she features a large Ocean View restaurant, panoramic Lookout Lounge and spectacular views from her Local Heroes Bar. On Deck 8, you will find an outdoor seating area that is perfect for those summer sailings through the gorgeous Marlborough Sounds. How do I get the latest travel news? Please see our Travel information page to find the best way to get the latest travel information for your journey. Can I change my sailing? You can change your sailing at any point prior to Check-In opening (i.e. one hour before scheduled departure). To change your sailing, simply log in to your booking online and select an alternative available sailing. You can change to an equivalent priced sailing free of charge or pay additional costs to upgrade to a more expensive sailing. How can I get in contact with Interislander? The easiest way for you to make your ferry booking is through our website. However, if you need to get in touch with us to assist with or change your booking, please contact us on 0800 802 802 (international: +64 4 498 3302) or by email on bookings@interislander.co.nz. We're around Monday to Sunday: 8am to 5pm. Can I sail on Interislander with my pet? Pets are definitely allowed to travel with Interislander - so feel to bring them on holiday with you! For dogs, we recommend you hire one of our kennels. These are available on each of our ships and can be added to your booking. Alternatively, you can leave them in your vehicle. Cats and other small animals can either be left in your vehicle or carried in a suitable pet carrier and checked-in. Please notify the Check-in attendant if you have a pet in your vehicle and we will try our best to park you in the shade. Please read our travel tips and pet policies before travelling to help your pet stay comfortable during the journey. How do I use an Interislander Promocode? Promocodes are offered regularly through our monthly newsletter, in selected publications and through business partners such as the AA. To use a Promocode, simply proceed to complete your online booking. After you have entered your passenger details and have clicked to proceed you will come to the Payment Details page where you will find the Promocode box. Simply type or paste your Promocode into the box and hit the enter button and the discount will apply. If you’re using a promo code for a group booking, please go to ‘group bookings’ under our book menu. The promo code will be the first thing you’ll be asked to enter before you can continue with the booking. Please note that many Promocodes are only valid on certain fares types and are date limited. If your Promocode is not working, then please check the booking date range, travel date range and fare types that were specified with the advertised Promocode. Can I send unaccompanied goods or vehicles on Interislander? If you want to transport goods, you’ll need to contact a professional freight forwarding company to transport this for you. If you have an unaccompanied passenger vehicle or car trailer you wish to transport, please call our passenger team on 0800 802 802 or email bookings@interislander.co.nz to ask about this service. Please note, we aren’t able to take unaccompanied motorcycles on Interislander. If you’re wanting to transport an unaccompanied commercial truck or truck trailer, please call our freight team on 0800 660 670 or email freight@interislander.co.nz. Can children travel Interislander unattended? Children under 15 must be accompanied by an adult. Adults are considered to be anyone over the age of 15. Those aged 15-17 years old will need to call us on 0800 802 802 if they wish to travel on a child fare without an adult fare included in the booking. If you’re not into airport queues, backseat drivers and ‘are we there yet’ every five minutes, the Interislander Ferry across the Cook Strait is a great way to jump between the North and South islands. First time crossing the Cook Strait? Whether you’re visiting from afar or are a Kiwi who’s never hopped aboard, the Interislander is an easy, comfortable and scenic way to jump between New Zealand’s North and South Islands. Here are some helpful tips to plan your journey. Drive on and drive off! Driving onto the Interislander Ferry doesn't have to be daunting. We've taken out the guesswork with our guide taking your vehicle onboard.